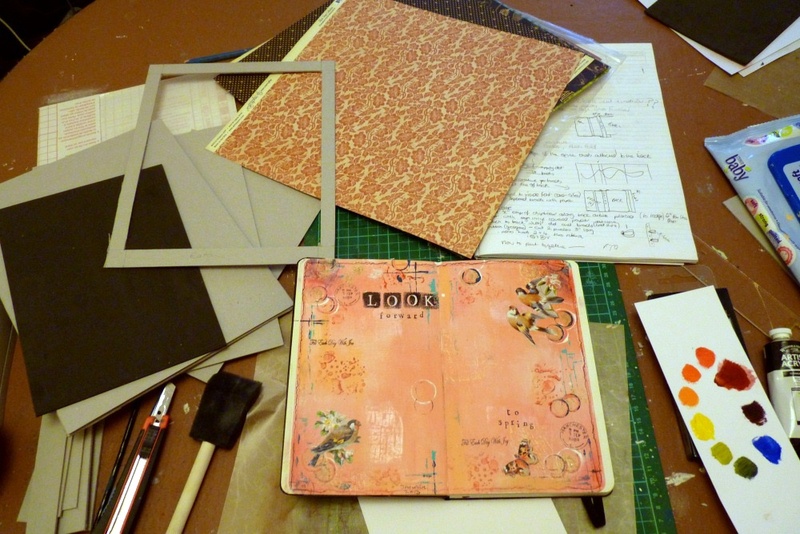 Another day, another journal page (but a new journal), that's what's on my desk this week. Thank kind elderly gent who visits around the end of December gave me some money (well someone did) and I have been very careful in spending it. I bought a moleskin sketch book and some new acrylics and have already done my first page following the techniques used by Kate Crane in the DVD I also got from Santa. The colour is truer on the close-up here. Bit more peach than apricot, or is it the other way around - I'm not a fan of squidgy fruit nor of any that has hair on (peaches - yuk). Middle is blank for some journalling - yes, I'm actually going to write in this one. 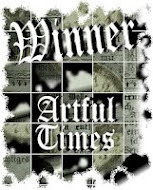 Am scheduling this post for Wednesday morning as I'm planning a lie-in as I had a bad night Monday (cold/flu bugs!!!) but I will catch up later. Hope everyone had a good break and can't wait to see what you all got from Santa. Trying to get round a few more desks this week - see you over at Julia's place for the starting line. 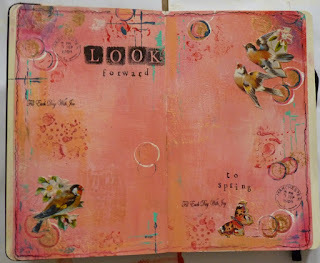 Ooh ann, love the journal page, what pretty birds...did you paint them? I dont do hairy fruit either, unless i can peel it, and thats a pain for everyone else, huh!! Love the colours of these pages Ann. Hope you're feeling much better now. Lovely to see you fired up for the new year. I always think it's an exciting time for crafters. Pages looking good, Ann - let me kmow if you'd recommend the DVDs, please? hi there Anne, I actually make Christmas cards all year and make most in the fist half of the years.. just my thing.. and am way behind this year already!! Love your journal pages Ann. Glad to hear you are feeling better and you will love Creative Jump Start when you get a look. There's a great messy tag one and No7 is super crackle effects. I have rolls of sticky backed plastic if you want me to post some to you. Give me rough sizes to cut as it's 2 foot wide so I can cut it a bit bigger than you need for you to trim to size. JLMK! Oh Ann, so sorry to hear you are I'll. hope it soon clears up, in the meantime rest and hot drinks are the order. Paperxhase. I got three before Christmas on a three for two offer so try them. Lovely gifts, moleskins are so nice and I would like to know how you find the KC DVD. Enjoy watching whilst you rest. That is if Sorrell will let you! So so pretty. I really love it, and the wide pen space for filling with journaling. I love the Kate Crane DVDs but annoyed I can't make them play on my Mac so I have to go back to an ancient (also Mac) laptop where they DO play so I can watch and experiment at my desk. Have fun with your journal and have a great WOYWW! lovely pages...so pretty, try a stationery store for the plastic,we used to cover out books in it....I hope you feel good real soon! I am new to WOYWW and friends with Sandee. Hope you have a chance to check out my blog and desk. What have you got against hairy fruit?? Lol!! Actually texture is so important with likes/ dislikes, isn't it? My husband detests jelly for the same reason! love the page, it is fun when you get a fab new book to play with, lucky you. If you like birds have a peek at shaz in oz's post . . . some great photos. Sorry to hear you are under the weather, Ann. Hope you are feeling a bit better now. 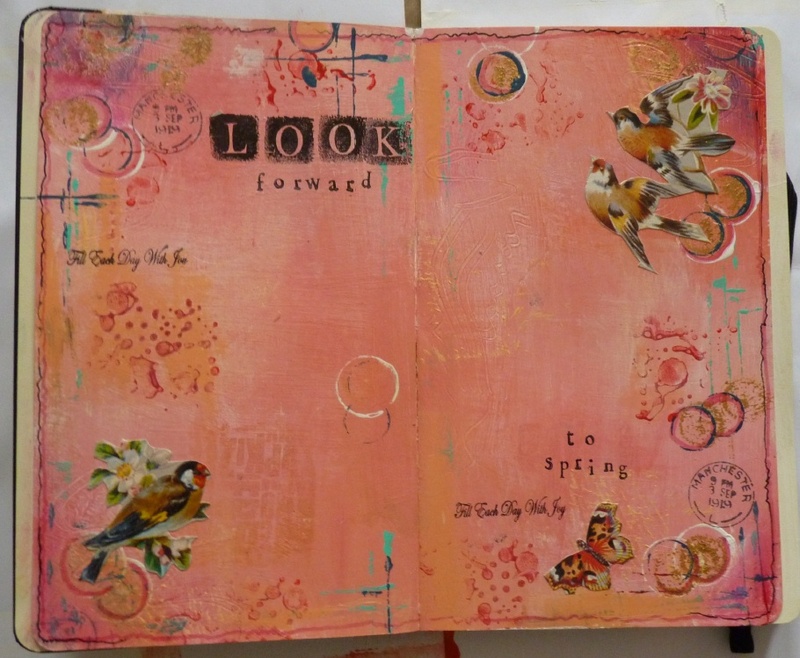 Love the look of your journal page. I could scrapbook on that it's yummy. It's funny, the same old man left me some money too but I'm thinking very carefully what to treat myself too!! 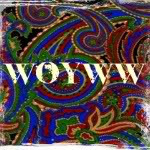 This is my first time at WOYWW and I hope you don't mind me looking around your blog while I am here. Oh I hope you get to feeling better, I have been sick also, still trying to recover. I love the Ipad cover idea...I'm going to go check it out. I hope you are feeling better now! You have a lovely journal. Love the journal page> i am hoping to start one this year. Your journals are lovely. I hope you're feeling better soon. Lovely journal page there Ann. I am with you on the hairy fruit though I do like a kiwi which people find funny that I eat like an egg! That elderly gentleman left me some pennies too and I am hiding it away until BSSBS in April! Well maybe! I love me to me pressies too. I usually buy my own to put in my stocking as Hubby forgets to put anything in. Like you cannot see it hanging above the fire! Great journal, Ann! And good for you to make your own cover for the iPad! Hope you find all the remaining supplies soon. The journal page is lovely! Congrats on your Ipad! I am a long term stamper and addicted to all things messy. Love my family, garden, crafts, books and all things nature. 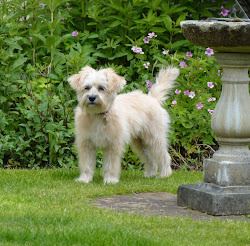 The new love of my life is my dog Sorrel - all I have to do is train her to clean up after me and put my stamps away and my life will be perfect. Two cards, one snowy dog.